Tucker House is set on five acres of striking beauty – with woods, gardens and grassy fields. You may take in the beautiful surroundings from the comfort of the shaded decks or brick patio. You might choose to explore the area by putting on hiking boots and roaming the woods around the secluded lake. Your sights will include the original stone spring house, a dry-laid masonry wall and the quarry that supplied the stone for the foundation of Tucker House and its outbuildings almost 180 years ago. Or, you might just want to lie on your back, floating on a raft in the pool, while gazing at the clouds. Nature, history and tranquility seem to co-exist in this place. This is a perfect setting for a bed-and-breakfast inn. Upon entering Tucker House, you will follow the cherry banister to the second floor where the four guest chambers await – each with its own private bath. While every room has been meticulously appointed with antiques of the era, three have been furnished with reproduction queen-sized beds for your sleeping comfort. 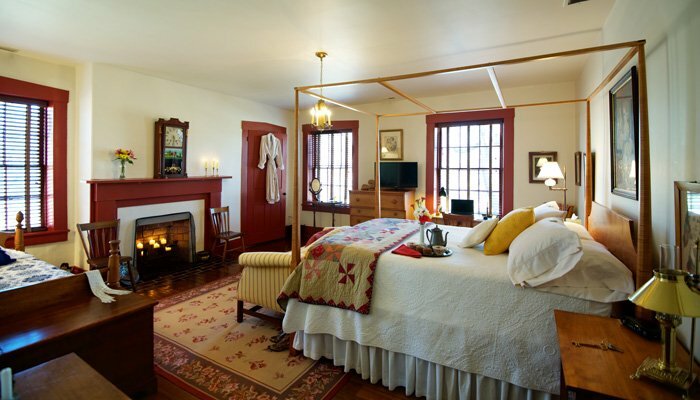 The fourth bedroom has an authentic 1820’s rope bed with full-sized bedding. The second floor also includes a common room where you may sample complimentary refreshments from the refrigerator at any time during your stay, as well as a Keurig coffee maker with gourmet coffees, teas, hot chocolate and hot cider. Step through the French doors of that common room onto the second-floor deck -- with your morning coffee or evening glass of wine – and enjoy the view that overlooks the wooded grounds and gardens. During warm months, a large in-ground pool is available for your pleasure. Wireless internet service and in-room satellite television are available to our guests twenty-four hours a day. 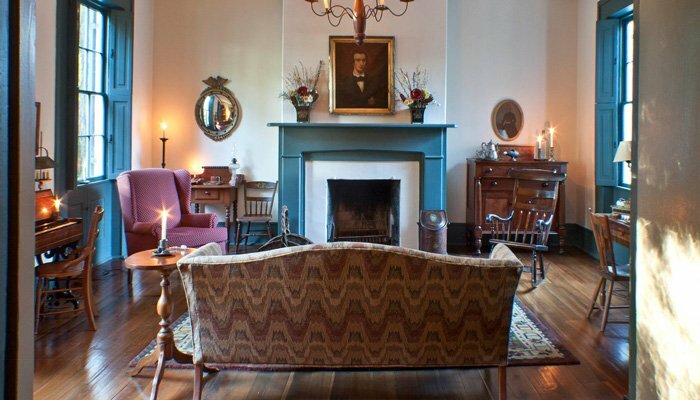 1840 Tucker House is a proud member of both the Louisville Bed and Breakfast Association and the Bed and Breakfast Association of Kentucky and has been awarded the Certificate of Excellence by Trip Advisor. Each chamber has a private bath with shower and tub, thick terry cloth robes, thirsty oversized towels, hair dryers and lighted make-up mirrors. If you forget any "necessities," or if you need anything that you don't see, just ask. We'll see to it that it's made available to you. 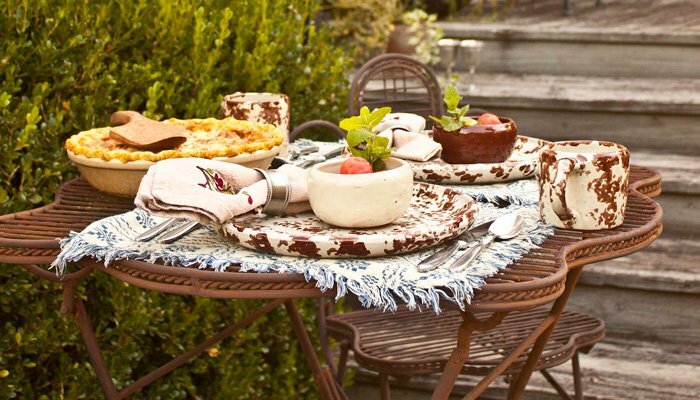 Your full “Kentucky-gourmet” breakfast may be served in the lovely, formal dining room, set with antique china, sterling silver and crystal – or, you might dine in the sunlit gathering room, with authentic Kentucky Bybee pottery and pewter. On those gorgeous Kentucky mornings, when the sun is shining and the outdoor temperature hovers around 75°, you could be served al fresco on the beautiful deck with myriad blooming plants surrounding you! In 1839, Hazael and Nancy Jane Tucker purchased their homestead and commissioned John Stone to build this brick, Federal-style home, which has now been placed on the National Register of Historic Places. Tucker House is located between the historic communities of Middletown and Jeffersontown and is just 15 miles from Louisville.